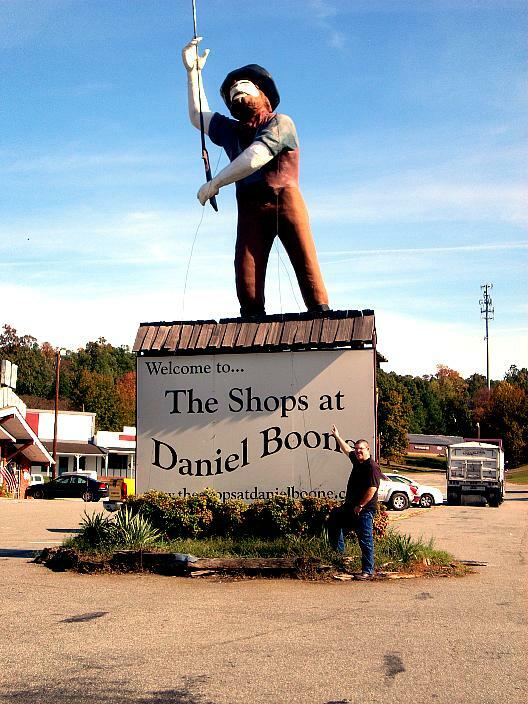 I did some digging through Google recently looking for some sign of the Daniel Boone Railroad. I was amazed to find a sign from the railroad on an auction site. I hope to get to Hillsborough for this auction and buy the sign. Growing up obsessed with trains both of my grandfathers embraced my obsession and encouraged it effectively. Both took me on many, many train rides. As fate would have it, my Dad’s father lived in Hillsborough, NC. Located right off I-85 at the Hillsborough exit, the Daniel Boone Railroad used to exist within a giant park, not too different than Tweetsie in it’s heyday. Shops, restaurants, rides and from what I can remember, an amazing train ride that ran back into the woods and looped around back to the front of the park. Like Tweetsie, the ride included cowboys and indians jumping on to act out a train robbery and gun fight. The posts I’ve written about the late Daniel Boone Railroad in Hillsborough are some of the most viewed on the site. Recently, I received an email from a guy we’ll call “Camo” who has fond memories of riding the train, as I do. He has volunteered to take some new pictures of the area, as well as share some of his old pictures of the RR. Here’s a teaser photo for you. Camo in Hillsborough, in front of old Daniel himself. In my quest to locate the train or locomotive I used to ride as a small boy with my grandfather in Hillsborough, NC…I have hit many dead ends. However, when I posted a story and photo of me in front of the train on this forum on January 3rd something interesting happened. Click HERE for the initial post. A gentleman from the Pacific Coast Railroad Company in California posted a comment about the engine known as “Melodia.” Come to find out, his company has the engine and operates it. I was thrilled. I had found the locomotive. I posted a follow-up story from my initial post exclaiming how excited I was to find the engine. Click HERE for the second post. The gentleman and I began corresponding over email. He asked if I had any other photos of the engine and I told him that all I had found so far was the one of me in front of it as a child (see below). He then informed me that the engine in this photograph was, in fact, not Melodia. 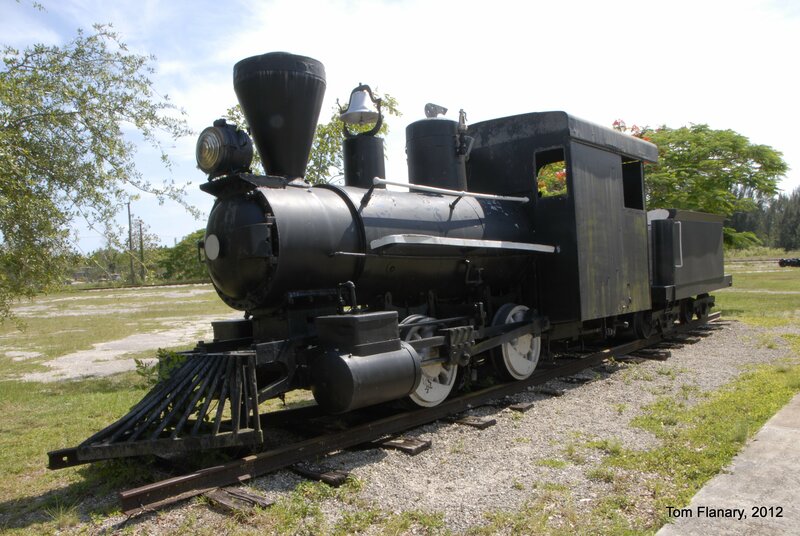 This engine is an old 0-4-0 that the Daniel Boone Railroad used in conjunction with Melodia, which was sold. The railroad continued to use this Cooke 0-4-0 even after Melodia had been sold. I have no recollection of the Daniel Boone Railroad having 2 locomotives. 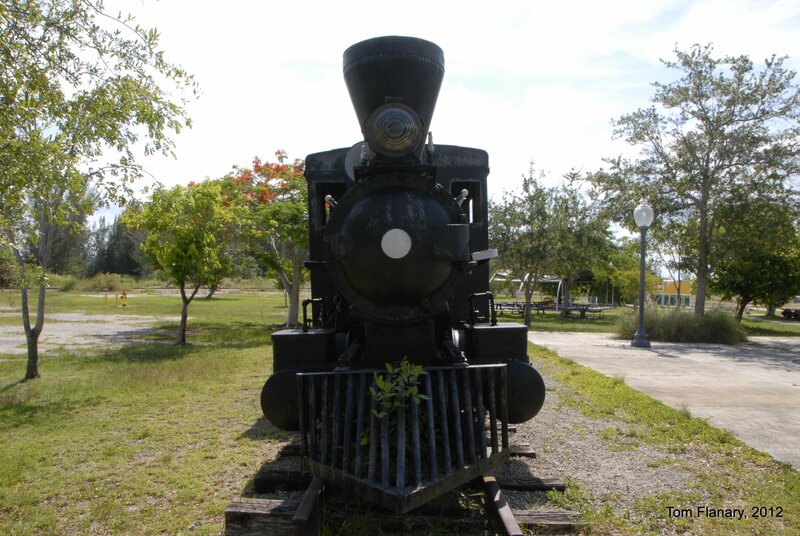 The gentleman was nice enough to share with me that the engine in my picture, old #22, is actually now in Miami at The Gold Coast Railway Museum, in diplorable condition. He sent me a link to it (HERE) with a photograph. Needless to say, I am somewhat distraught. Here it is. I’ve finally found the engine. And it’s just in sad shape. My plans now are to contact the museum to see what can be done, if anything. I wish I was ridiculously wealthy and could afford to purchase and renovate the locomotive. Oh well, one can only dream. Daniel Boone Railroad/Lost Train of Hillsborough, NC – FOUND!!! Back on January 3rd I posted my story about the train I used to ride with my Grandfather in Hillsborough, NC. I have some very vivid and fond memories of the locomotive and train ride. For years I’ve made an effort to find out what happened to the equipment, as it seemed to have just disappeared into thin air. Calls and emails to the people at Daniel Boone Village, now a shopping mall, yielded no results. However, a funny thing happened. Someone from the Pacific Coast Railroad Company posted on this blog letting me know that they owned it and it’s still in operation. Located 10 miles north of San Luis Obispo, California, the company apparently owns several engines and operates them often. Great website too. Pics of how the locomotive looks today are on this post. Needless to say, I was excited to learn this and I’m enjoying digging through their website, learning about the history of the engine and viewing the pictures. For the history of “Melodia”, as it became known as, click HERE. Growing up obsessed with trains both of my grandfathers embraced my obsession and encouraged it effectively. Both took me on many, many train rides. As fate would have it, my Dad’s father lived in Hillsborough, NC. 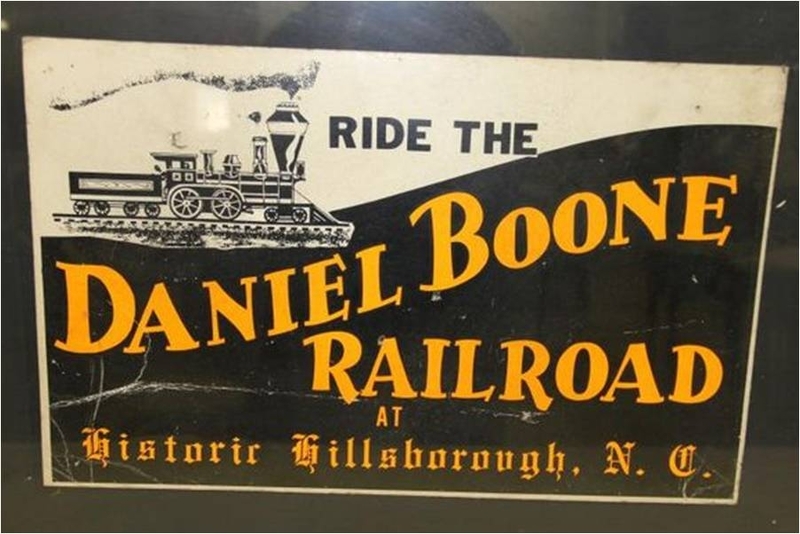 Located right off I-85 at the Hillsborough exit, the Daniel Boone Railroad used to exist within a giant park, not too different than Tweetsie in it’s heyday. Shops, restaurants, rides and from what I can remember, an amazing train ride that ran back into the woods and looped around back to the front of the park. Like Tweetsie, the ride included cowboys and indians jumping on to act out a train robbery and gun fight. My memories are blurry and how I wish I had more photographs to document the train and its surroundings and ride. For some reason the train was sold, the park was sold and turned into a trailer park. Today, there are some shops and outlets and when I come through the area I always explore what I can of the area. I’ve found what’s left of the ride and some ramshackled tracks. All I have to remember it by is a picture of me in front of it when I was 4 or 5 years old and it’s existence in my mind is almost mystical now that I’ve come full circle in life and have a son who is obsessed with trains. Below is all the information I could possible find on what happened to this incredible train and railroad. Included is that picture of me, what’s left of the tracks and a photo of the train from when it was sold to Carowind’s, a theme park located south of Charlotte, NC. Not sure how old I was here….maybe 4 or 5 years old. All that’s left of the Daniel Boone Railroad. Carowinds #1 “Melodia” (Now Paramount’s Carowinds in Charlotte, NC) [actualy south of Charlotte in Ft. Mill, SC –ed.] was the only 36″ gage Crown built on an historical chassis and the only one which was not a 4-4-0. 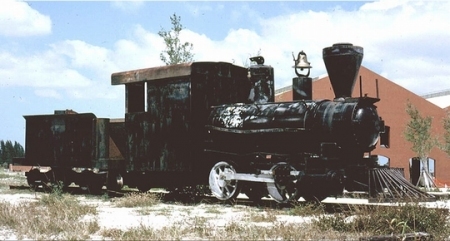 It started life as an 1897 Porter 0-6-2T (c/n 1790) with 9″x14″ cylinders at the Barker and Lepine Plantation in Lafource Crossing, Louisiana, then moved to the Laurel Valley Plantation in Tribodaux, LA at an unknown date where it was named Melodia. At another unknown date, it became a part of the Arthur LaSalle collection. In 1960, it was sold to Hubert Mitchell Industries and was stored in Hartselle, Alabama. It was then sold to James Freeland who owned Daniel Boone Village near Hillsborough, NC where it was run at the owner’s whim. Freeland subsequently advertised the engine in Hemmings Motor News and sold it directly to Carowinds. Sometime between Hartselle and Carowinds, it was rebuilt by Crown into an oil burning 2-6-2 with tender. In the process, it received a Crown boiler (Dave Barnhardt tells me that he thinks the boiler was already on the floor at Crown before the project was initiated so maybe it was pushed ahead of another project), Crown tender, arched roof cab, cowcatcher, headlight, steam dome, and a tall, skinny diamond stack. It retained the hemispherical Porter sand dome, the inclined Porter cylinders (with the Porter name cast into the steamchest), the Porter (Route 66 shaped) builder’s plate, and the Porter smokebox door, also with the Porter name cast in. This rebuild supposedly happened in 1963, but the boiler appears to be more the size of the post-1970 Crowns. At Carowinds, #1 carried the name “Melodia” on the left side of the cab and the letters EPH on the right side of the cab for E. Pat Hunt, the developer who built the park. Melodia is reported to have run at Carowinds on June 13, 1972 for a publicity day, even though the park did not open to the public until March 1973. The ride circled the park which was divided in two by the North Carolina / South Carolina border (I wonder which state inspected the trains?). The station was at the front of the park, but unlike Disney where the station is over the main street, at Carowinds it was a depressed platform under the park entrance. The railroad was partially dismantled after the 1977 or 1978 season (one account says 1975) to make room for a new theme area (I’m told they didn’t want grade crossings), so the equipment stayed at Carowinds for a few years unused. Melodia was sold in June 1980 to the George Roose collection in Cleveland, Ohio (George was part owner of Cedar Point Amusement Park in Sandusky, OH and he built the 36″ gage Cedar Point and Lake Erie RR in 1963 out of his pocket when the park’s Board of Directors wouldn’t build it !!). One account had it going to western New York, possibly to a park near Springsville, but I have no evidence of it being used or of a park existing there. There was also a rumor that it went to Rome, NY, but that has been proven false. In 1982, it did arrive (and possibly run) at Wild World (now Six Flags America) in Largo, Maryland but returned to Sandusky, Ohio by 1984 where it stayed until at least October 1985 (there is no evidence that it was ever on Cedar Point property, so it must have been stored at Roose’s home). George Roose died in 1992 or 1993. One individual told me that after a couple of years it then passed through Shop Services in Iowa on its way to a developer in California. That’s where the trail stops. Does anyone know anything more about this lost locomotive? Carowinds is said to have built four of Melodia’s coaches themselves from D&RGW steel chassis (which have more of a “trolley car” roof than the Crown coaches), and one is now at the LaPorte County Steam Historical Society railroad in Hesston, Indiana. John Harbeck tells me that several were available in the Roose collection at the time. I do not know the whereabouts of the others today.